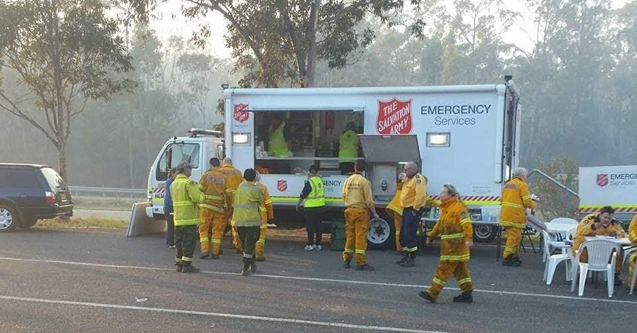 The Salvation Army is on the frontline responding to communities affected by the Queensland bushfires that are raging across the state. Salvation Army Emergency Services (SAES) and other disaster services teams have been on the ground in Miriam Vale, 70km south-east of Gladstone, and in hard-hit Gracemere, 13km south-west of Rockhampton. Around 8000 people were evacuated in the Gracemere area, where SAES volunteers have also been catering to many of those impacted, with more than 240 meals being served for those in need. Residents have been told to stay informed regarding these fires. In Bundaberg, SAES volunteers, based at The Salvation Army Tom Quinn Centre, are providing catering to fire crews battling nearby blazes. Meals have been prepared by the Bundaberg Corps. In other parts of Central Queensland, residents are being told to leave immediately as bushfires flare up in Winfield, Captain Creek and Broken River, west of Mackay. A “leave now” alert is in place for Deepwater, Baffle Creek, Rules Beach and Oyster Creek. The SAES teams are watching for further developments in these areas. People requiring support are being advised to visit the Evacuation Centre, call the Gladstone Regional Council’s call centre on 07 4970 0700, the Community Recovery Hotline on 1800 173 349, or attend the Agnes Water community meetings. Support can also be accessed at a Recovery Hub (41 Blomfield Street, Miriam Vale) that is open from 9am–5pm. S.T.A.N.D. (Support Through Australian Natural Disasters), The Salvation Army & Woolworths’s partnership to support Australians during times of natural disasters, will be distributing much needed funds to help with the affected communities response, recovery and resilience. Queensland authorities are warning people to remain on high alert as there is a very high likelihood the fires will stretch into next week. The SAES team are on standby to respond where necessary. If you would like to donate to support those affected by the fires, you can donate at the link below. Alternatively, you can also donate at any Woolworths checkout.